PBJ Quilt Sandwiches: It Takes Two To TANGO! 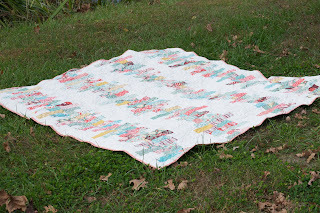 Another one of my "hiatus projects" was making this lovely little lap quilt that I called Tango, that I was inspired to make from the Moda Bake Shop. 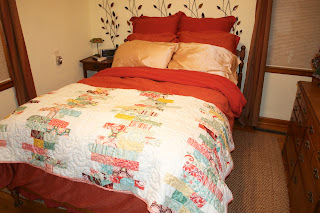 I followed the instructions pretty closely but made the quilt bigger than the example. 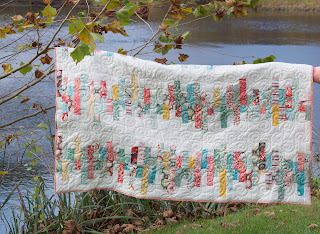 It features Moda's Fandango fabric from designer Kate Spain. I absolutely love this line of fabric and wish I had more of it to keep making things!! 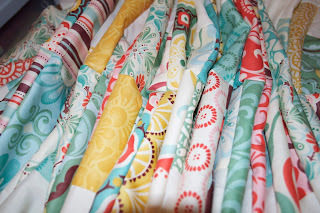 Maybe I'll hit eBay up and buy some more soon!! :) The gals at Melear's quilt shop did a fabulous job quilting this!